Two Gentlemen of Verona. Dir. Joe Dowling. Perf. Sasha Andreev, Sam Bardwell, Michael Booth, Sun Mee Chomet, Laura Esping, Nathaniel Fuller, Jonas Goslow, Hugh Kennedy, Jim Lichtscheidl, Valeri Mudek, Kris L. Nelson, Lee Mark Nelson, Isabell Monk O'Connor, Randy Reyes, John Skelley, and Wyatt Jensen. Guthrie Theatre Company. Minneapolis. 24 January—29 March 2009. The same director who gave us A Midsummer Night's Dream last season (for which, q.v.) is currently directing the Guthrie's production of Two Gentlemen of Verona. I promise a review once I've seen it; in the meantime, you'll have to be content with the image from the newspaper and it's lovely caption (click the image above to enlarge it). 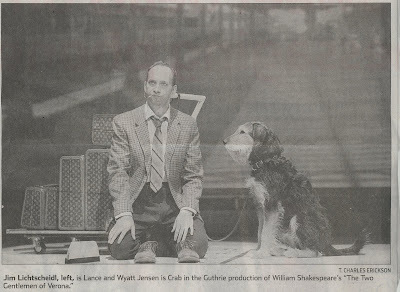 Although the seeming strangeness of the first phrase of the caption can be explained away by the fact that the dog's name sounds very much like a person's name, I still think a picture with a man and a dog and the phrase "Jim Lichtscheidl, left" is a little odd. However, I can't want to see Wyatt Jensen's Crab. His portrayal of Moonshine's dog (opposite an intriguing thorn bust and a well-mannered lanthorn) was understated but effective.